B4Cast is an advanced software package for simulating temperature evolution and the development of properties in concrete structures during early-ages. It is one of the components of a complete thermal control system that also includes HeatBox and HeatWatch or TMS. 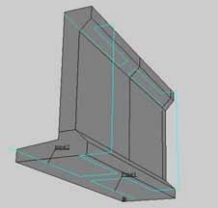 The software allows modeling different construction methods for a given structure in order to arrive at optimal solutions for limiting the maximum internal early-age temperature, reducing the risk of early-age cracking due to thermal effects, or ensuring adequate strength at critical stages of construction, such as formwork removal or post-tensioning. B4Cast is based on heat transfer in 3-dimensions, which permits accurate simulation of heat transfer in a structural element of any shape. In all cases, the concrete structure may be damaged permanently and the durability, functionality, and appearance will be substantially reduced. On the other hand, it is also important to avoid using costly preventive measures that may unnecessary. By running simulations of alternative schemes before the start-up of a project, engineers can arrive at economical solutions for reducing the risk of early-age damage. Contractors, in planning construction methods to meet specification requirements and economic limitations. Consultants, during the design phase to permit checking the feasibility of planned construction activities. Precast concrete producers, for optimizing production schedules. 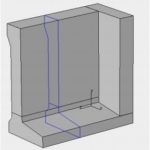 Because B4CAST is based on the finite-element method and modeling is in 3D, a wide range of problems can be solved. Extensive knowledge of the finite-element method is not required. The computer-program is menu-driven and simple to use. The information needed to run an analysis includes description of the construction method, thermal boundary conditions, and properties of the concrete that will be used. A mouse click starts the calculations, and various graphical outputs are available to check if the results are reasonable. Volumes corresponding to different placements are defined geometrically. Time of placement and the placement temperature are defined. Volumes are prismatic with arbitrary polygonal cross sections. Material properties can be imported from and exported to libraries. Thus the same material can be used in different analyses. The software includes ready-to-use default material properties. Thermal barriers: user defined formwork, insulation, etc. All boundary conditions are functions of time. Thermal barriers can be imported from and exported to libraries, which allows the same materials to be used in different projects. 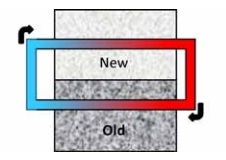 The software includes several ready-to-use thermal barriers. In the third system (with plant), the pipes can be made into heating pipes by proper definition of the target temperature when the water exits the plant. 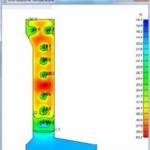 The structure can be provided with displacement boundary conditions to model external restraints. Displacement boundary conditions are also used to specify planes of symmetry for reducing analysis run time. 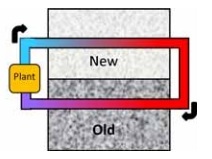 If insufficient displacement boundary conditions are supplied by the user, the software automatically provides boundary conditions so that the structure is statically determinate. 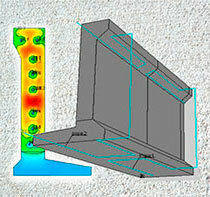 The analyses (thermal and stress) in B4Cast are performed by means of the finite-element method. The structure is meshed automatically into tetrahedrons. The variation of temperature and stress within elements is assumed to be parabolic. A coarse mesh can be used for the initial analyses to check that model has been described correctly. The thermal analysis is performed first, and, if required the stress analysis is performed subsequently. Based on initial results, a finer mesh may be required to produce smoother temperature or stress distributions within the structure. Variations of desired parameters at a specific time in the analysis are presented as contour plots at user-defined cross sections. Cross sections with extreme values of the parameters are located automatically. Conversely, variations of given parameters as a function of time are presented as graphs of minimum and maximum values, average values, or values at user-defined locations. An example is presented of a wall built between an existing foundation and an existing end -wall. The formwork is 21 mm plywood; the upper surface is protected by tarpaulins; open- circuit cooling pipes are used up to a time of 48 h and the inlet water temperature water is 10 °C. The initial concrete temperature and ambient temperature are 20 °C; and the wind speed is 5 m/s. The contour plot below shows the temperature distribution at the wall cross section, indicated with blue lines in the sketch of the structure, at 22 h after casting the wall. 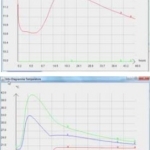 The graph below shows the time histories of the inlet water temperature (green) and outlet water temperature (red). The blue line in the graph to the right shows the variation of the average wall temperature with time. 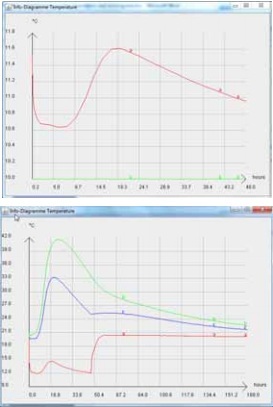 The green curve is the variation with time of the point in the cross section that experienced the maximum temperature. The red curve is the temperature variation at the point in the structure that had the lowest temperature. The discontinuity at 48 h represents the effects of shutting off flow through the cooling pipes.